Yet again I feel a real sense of pride and honor to present another fabulous Canadian diaper company to you! 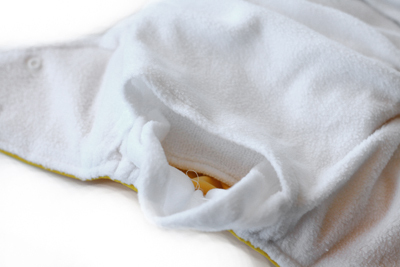 Hipkiddo cloth diapers, though manufactured overseas, are a brand name based out of Maple Ridge, British Columbia. Founded by Michelle Leyenhorst and her family (husband, Josh, and two sons), Hipkiddo remains family owned and operated and aims to remove the middleman as much as possible from the cloth diaper purchasing process, especially in terms of price. They have definitely achieved this goal! Their one-size pocket diapers, available in a rainbow of cute colors, sell for only $8 a piece, and that's also including the microfibre insert (or for only $7.50 each if you get a starter pack of 12 or more!). Hipkiddo also has terrifically inexpensive drawstring wetbags for only $5 a piece. At these prices, Michelle has definitely stayed on par with her original goal of providing average families with a cloth diapering solution that doesn't break the bank! 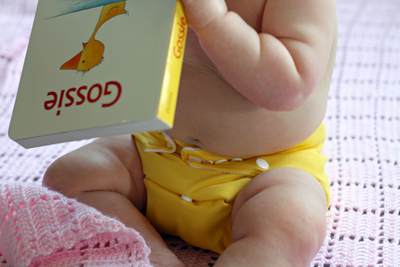 Up for review, Michelle sent me a darling sunshiney yellow pocket diaper to demo with our 9 month old daughter. The second I unpacked the parcel, I knew that this diaper would be one of our new favorites. 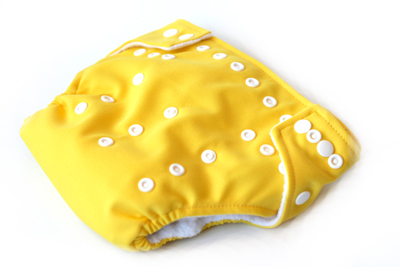 The cheery yellow PUL waterproof outer shell was flexible and soft. The polyester microfleece inner lining was so, so soft! Also included with this diaper came one super soft 3 layer microfibre insert for stuffing into the pocket. After one quick prep-wash, we were ready to try the diaper out. 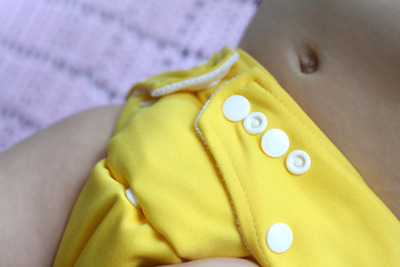 I've noticed a lot of pocket diapers lately have been coming out with a new snapping pattern that I LOVE. I've already reviewed Dinkledooz and Comfy Rumps diapers, which also have a similar snapping pattern to this one, and it's no secret that it's my favorite snap layout and the one that time and time again works best for us. These Hipkiddo diapers have a huge variety of snaps, including two top row snaps on either side, and a hip snap on both sides as well. Being able to snap up a hip snap is pretty critical on the diapers we use as it's what best prevents leaks from around the legs (especially for a side or tummy sleeper). The other most important thing I like in a snapping diaper is something else that these Hipkiddo diapers also have--the ability to have cross-over snaps. 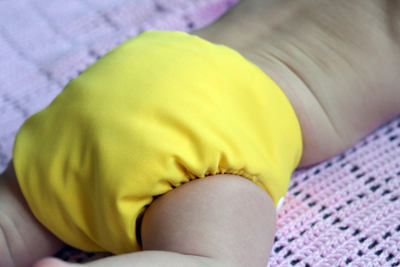 For tiny waisted babies, the crossover function is the best way to truly have the pocket diaper work properly at the lower end of its weight range. The build of this diaper has great stretch and flexibility, which means that the tabs easily stretch and bounce back to their snapped position, allowing a really flawless fit. Of course, since this is a one-size diaper, there are also three rows of rise snaps to adjust for small, medium, and large fit. With all these available snapping options, I would estimate that this diaper could fit very well from about 8-40lbs, or well into the average potty-training years, anyways. The snaps are a great construction and hold up to tough pulling and snapping. The other thing I love about these diapers is their "envelope" style pocket opening. This means that there is a little flap that comes overtop of the pocket to keep the insert tucked in and to prevent it from riding up and creating wicking problems during sleeping, crawling, etc. The pocket, though not as generous as some, is an easy size for stuffing and is snug enough to ensure that the insert doesn't slide around after it's been placed inside the pocket. We've used this diaper for around the house, for day trips, and for long periods of sleep with intense heavy wetting. I've sometimes double stuffed it for sleep with one extra insert from our stash, and this diaper has never leaked or wicked, even with side sleeping, etc. I honestly attribute a lot of that to the great elastic and the hip snaps. For heading out and about, or for wearing under cute pants, I would say that the this diaper is also very trim for a pocket diaper. It would be slightly more bulky than a FuzziBunz (but only because of the snap-down rise segment), and a little more trim that most of the KaWaii diapers I've tried. Part of its trimness, I'm sure, is also because of how soft and flexible the shell stays, even after multiple washes. Head over to the Hipkiddo website right now to buy one of these awesome one-size pocket diapers of your very own, for only $8.00! 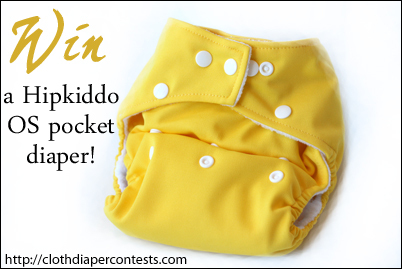 Hipkiddo is also offering one lucky winner a one-size pocket diaper in their choice of color! Mention your favorite diaper color from the Hipkiddo website. Make a purchase from the Hipkiddo website. Give yourself 2 entries for each item purchased & mention what you bought. Final details: I received no financial compensation for this review or giveaway, though I did receive the sample items free of charge. All opinions shared are my own, and I was not persuaded to share anything other than my own thoughts. Other users may have different experiences with this product than what I have shared. This giveaway will end on June 4, 2011 at 11:59pm MST and is open to residents of Canada and the United States only. Winner will be chosen randomly using random.org’s services. The winner will be contacted by email and will have 48 hours to reply before a new winner is chosen. The prize will be supplied and mailed out to the winner by the sponsor of this giveaway. My favorite diaper color from the Hipkiddo website... is all of them!!! But I think blue is nice! I liked Hipkiddo on Facebook. I have liked HipKiddo on facebook for awhile!! Also wondering if it is $8.00 in US? I love the yellow dipes! MY favorite diaper color from the Hipkiddo website is blue. I really love how vibrant the yellow color is. i liked hipkiddos on facebook (kristen crenshaw) + i love love love the green, gray, and blue shades of diapers!! :) they'd make my handsome son even more handsome while sporting smart, eco-friendly baby attire! I am following Cloth Diaper Contests and Giveaways via GFC as The Hoosier Housewife! I visited the website and love the green hipkiddo diaper! I am following on Networked Blogs ! I Follow the Cloth Diaper Contests & Giveaways blog with Google Friend Connect! I now Subscribe to email updates from the CDC&G blog! My favorite from the Hipkiddo website is yellow. I like all the colors, but I LOVE the orange one! :) too cute! I like the orange Hipliddo diaper. I like Cloth Diaper Contests & Giveaways on FB! I like HipKiddo on FB! At long last, after researching for 3 months, I've found the brand for us! I absolutely adore the yellow colour, it's fantastic. I like the Blue Hipkiddo the best! Like Cloth Diaper Contests and Giveaways on Facebook. I follow this blog via GFC: Mama Megs. My favorite diaper color is orange! I like Hipkiddo on facebook! I love the blue hipkiddo diaper, super cute shade! I like Hipkiddo on FB! I like Mom Savvy Media on FB! I 'like' CDC&G on FB: Meghan Vera. I 'like' Hipkiddo on FB: Meghan Vera. I vote for CDC for on the fence! I 'like' Mom Savy Media on FB: Meghan Vera. My favourite color is orange!!! I liked mom savvy media on fb. I follow yor blog with GFC. I like the purple diaper colour. I already like Cloth Diaper Contest & Giveaways on Facebook. I follow the blog Mom SavvyMedia with GFC.